It’s been 38 years since I was adopted from Vietnam during Operation Babylift and began my journey in the United States. During the years I often stopped to think about the other adoptees, the other Vietnamese families that left Vietnam and the volunteers from Operation Babylift. In 2000, I had the pleasure to attend two reunions and catch up with fellow adoptees and learn more about our special history together. As the years went by I lost contact with many of the adoptees. In 2009 I joined forces with ATG founder, Tammy Nguyen Lee to produce a documentary film called Operation Babylift: The Lost Children of Vietnam. It was an honor to meet many of the heroes of the babylift and make new Vietnamese adoptee friends. Facebook groups have slowly reconnected me with adoptees from around the world, pre and post Operation Babylift. This summer, Vietnamese American and founder of non-profit organization Torch 1975 Inc. has planned a special gathering to bring our special community together once again to reconnect and honor our past. Torch 1975 Inc. (www.torch1975.org) a non-profit and non-partisan organization has announced the President Ford Centennial Birthday and Operation Babylift Reunion Celebration. The gathering will be held in Dana Point, Calif. July 12-15, 2013. Torch 1975 will bring together Original Flight Crew, Veterans and War Orphans to Celebrate and Honor Former President’s Efforts. This reunion will feature a panel of Operation Babylift participants and War Orphans. The event will be kicked off on Saturday, July 13th at 10:00 am with a tribute to President Ford and reenactment of the events that took place on April 5, 1975. All events are open to the public and include a panel discussion from reunited veterans and refugees from Operation Babylift on Sunday, July 14 at the OC Sailing & Events Center. The event will commence on Monday, July 15th, celebrating Gerald Ford’s favorite pastime: Golf. The Gerald R. Ford Memorial Golf Tournament will take place from 7:00 am to 2:00 pm at San Juan Hills Golf Club in San Juan Capistrano. Calif. Guests can register for Gerald Ford Centennial Gala and Operation Babylift Reunion event by visiting www.Torch1975.org. I recently had the chance to ask Torch 1975 founder, Jessica Nguyen a few questions. Check out the interview below. 1. What inspired you to bring this event together? As you see in my Epilogue, 1975 is a key element in my entire life. I have researched many areas of the 1975 era: refugees, immigrations, children, families, generations, Fall of Saigon, New Economic Zones, Children of Vietnam War, Soldiers, Communists, death, America and the freedom world, adoption, survivors, military, etc… One of the areas that attracted my concentration the most was how other children were affected by the war? And of course, Operation Babylift (OBL) with the stories of some 3000 babies and their lives airlifted out of Vietnam in the closing days of Vietnam War, being adopted and living overseas always comes up on the top of the list of any on-line search return. I first found out about OBL in late 2011. OBL is so fascinating, I am not the only one who knows about OBL; cannot leave it alone without further researching. Being aided by Social Media, I was able to connect at first with your group via Mr. Phil Wise – a C-5A Galaxy crash survivor and a Vietnam Veteran – right on April 4th last year; many crash survivors consider April 4th 1975 as their second birthday. I invested more and more time to learn and understand about the nature of the story. I see President Ford as a hero, a Father of all these OBL children. I was so touched and came to tears when I read the article http://www.presidency.ucsb.edu/ws/?pid=4812 about April 3rd 1975 – the date he encountered hostility from major broadcasting companies about his decision to evacuate War Orphans from Vietnam. Many of his staff members were also against this move. Despite the red-tape and bureaucracy in Washington DC, he stood firm in his decision; and the result is our Children of Vietnam War can be rescued, survive, and grow up peacefully in this freedom land – America! He even went the extra mile to personally greet the babies arriving in San Francisco Int’l airport on April 5th, 1975. As a child who grew up with only one parent – my mother, I often question how other children grew up with the lack of a parent like myself? I am so amazed how you guys grew up as family adoptees to be fine people like we see in this group. The OBL community is indeed quite wonderful. Looking deeper I can see Chris Colan, Mindy Kelpe, Tim Holtan, Kate Bukart, Jim Zimmerly, Jared Rehberg, Gregory Hodges, each and every one of you, a portrait exactly like your family’s last name. I sometime wonder why not Jared Colan or vice versa? God really arranged everything? There must be a special power, besides the help of President Ford, to place each of you in the right family. Adoption is great! 2. Is there a particular highlight of the weekend you are excited about? 3. For all the adoptees around the world who can’t make it, is there anything you’d like to say or share with them? As Children born during the War time and growing up in hardship, we have a common bond. We should keep in touch, support each other as much as we can, stay in the loop and network by all possible means. Join the group, share your stories, pass the word about our EVENT for your friends/adoptees to come and meet one another, buy our Event DVD, etc… We would love to see and hear from all OBL members and adoptees out there worldwide. ‘Hi & Hugs’ are sending your way from us! Torch 1975 Inc. (www.Torch1975.org) is a non-profit, non-partisan organization working to support and serve America’s Veterans. Based in Dana Point, Calif. – The mission of the organization is ‘ECHO’: Educate; Connect; Heal; and Optimize situations for Veterans dealing with Readjustment issues, Employment, Educational Assistance, Scholarships, and Family Planning. 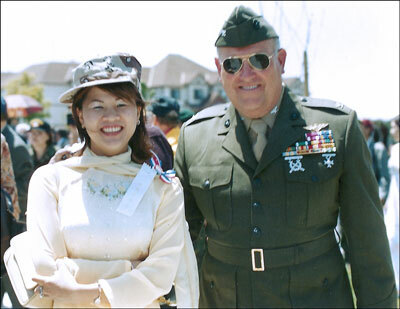 The organization was founded by Jessica Nguyen, a POW’s daughter, and was later joined by Colonel Joe Snyder – a retired Marine and former Mayor of Dana Point, Calif.
Torch 1975, Incorporated is a non-profit, non-partisan 501(c)(3) charitable organization dedicated to supporting America’s Veterans. Torch 1975’s California entity license is C3399380, Federal EIN number is 45-4324829. Donations are tax-deductible to the fullest extent of the law.